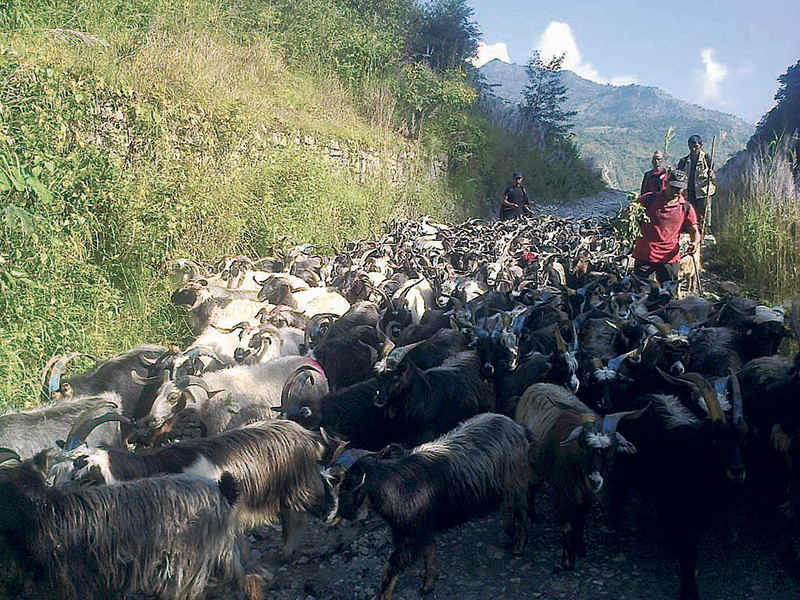 MYAGDI, Sept 12: Mountainous district Mustang in the western Nepal will supply at least 25,000 sheep and mountain goats to different markets of the country during the upcoming Dashain festival. Locals of Mustang are attracted to sheep and mountain goat farming as the district has comparative advantages of access to grazing fields, proximity to Korala (Nepal-China border point), good market price and subsidy plus technical help from District Livestock Services Office. With the festive season nearing, traders from Dhaulagiri zone and Kaski, Chitwan, and Kathmandu districts have reached the farmers' homes to buy sheep and goats. 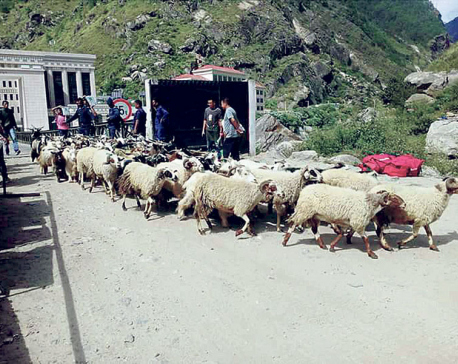 Farmers from upper Mustang villages like Charang, Lomanthang, Ghami, Surkhang, Chonhup and Choser have started to take sheep and mountain goats to the settlement area. Aita Bahadur Thakali, planning officer at the Livestock Office said that farmers have started selling the livestock as the Dashain festival was nearing. He said that last time even young people had started goat farming because of availability of appropriate grazing area. The office stated that this year healthy livestock would be supplied as no disease had been discovered in the grazing area. “Farmers increase the number of livestock in their farms as the earning is good. They are also happy about the technical help they get in their respective homes,” said a staff of the office. Last year a transaction of Rs 270 million had been made by supplying 13,000 sheep and 9,000 mountain goats from the district. Livestock technicians say that the management of mobile grazing area has encouraged farmers who have livestock farming as their major earning source to add up the number of livestock in the flock. The office has deployed staff to record the data of the livestock in different villages of upper Mustang and border of Myagdi district. Pasang Gurung of Chesor said: “Snow leopards used to attack the flock. Now the damage has been minimized this year by building shed beside human settlement and mobile shed.” He added that traders have started coming to the villages for sheep and mountain goats. Nepal Food Corporation supplies sheep in the range of 1,500 every year. Tibetan traders are targeting to sell sheep and goats to farmers from Mustang at the inter-country fair organized at the bordering areas. Traders from other districts do not have direct access to the fair. Tibetan traders, however, prioritize Chinese market. The traders had declined to sell the livestock in the past as the demand in China had increased. An estimated number of 9,000 mountain goats is expected to be imported from Tibet this year. Traders compete to sell the livestock as the import will be strict after the end of fair. While Tibetan traders say that despite good earning from Nepali market, irregular functioning of the border has caused problems in the business. Jhongwasen of Tibet is considered as the pocket area of sheep and mountain goats.